As a result of collaboration of state and community leaders, the U.S. Forest Service, the Bureau of Land Management and more, Iberdrola Renewables Inc. has its required permits in place and has begun construction at its biomass plant. 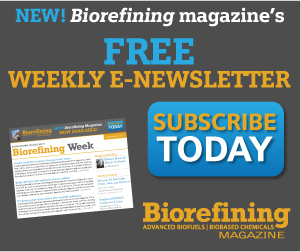 The U.S. EPA's guidance for developing best available control technologies to reduce greenhouse gas emissions at industrial facilities was welcomed by biomass proponents who say it confirms that biomass has a role in limiting climate change impacts. On-site testing of a waste heat recovery landfill unit (HR-L 300) in Oxfordshire, U.K., has shown an increase in electrical output of more than 20 percent as determined through internal testing by developer Clean Power Technologies Inc. The hotly-contested Laidlaw Berlin, N.H., Biopower LLC project has received site and facility approval from the State Site Evaluation Committee. The plant would use 750,000 tons of wood chips to produce 70 megawatts of power. University of Illinois researchers identified a potential new insect-transmitted switchgrass virus that could reduce biomass yields. Belonging to the genus Marafivirus, the virus is characterized by mosaic and yellow streaks on switchgrass leaves. 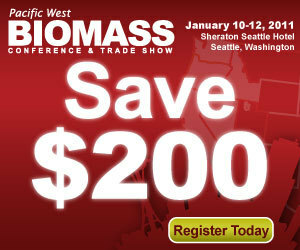 Prospective biomass project developers looking to learn about the process can attend the panel Case Studies and Research in the Utilization of Wood Waste Streams for Heat and Power at the Pacific West Biomass Conference & Trade Show in Seattle. The Union of Concerned Scientists called the U.S. EPA's recently released greenhouse gas emissions guidance fair, practical, affordable and technologically feasible, adding that two key recommendations involve energy efficiency and biomass. The pulp and paper industry possesses the potential to increase profitability once again by converting mill waste sludge into cellulosic ethanol, which is one of several topics to be presented at the Pacific West Biomass Conference & Trade Show.